Galileo Factory is a large medal game from Sega. The machine has a large criss-crossed roller coaster like structure in the center of the unit. Players maneuver coloured balls on the coaster by using a small wheel, and the aim is to drop the balls in a particular place. There are also a variety of bonus games and jackpots available. 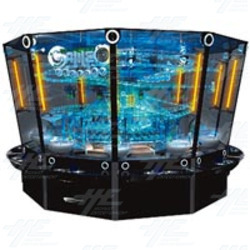 This is a fan made video of SEGA's Galileo Factory 2 medal game machine. This is a fan made video of Sega's Galileo Factory Medal Game. A video by DigiInfo at the AOU 2009 of the Galileo Factory medal game. Galileo Factory is medal redemption game by Sega.